Youtube has been one of the key tools of activists across the globe, and particularly in the Middle East. In response to requests from NGOs and activists on the ground who are naturally concerned about their safety when uploading videos to the site Youtube has today launched face blurring. This tool allows video uploaders and editors to obscure faces within videos with the click of a button. The screenshot below, which is taken from Youtube’s blog page and post on this new service, is an example of how the technology will work in practice. It’ll be interesting to see how often this is used by activists, and how authorities will respond. Kudos however to Youtube and Google for listening and providing a solution that should, I hope, save people from torture, intimidation, or worse. The picture above shows clearly how simple it will be from now on to blur people’s faces on Youtube. PS this is going to give marketers out there a fun new way to roll out teaser campaigns! I can’t wait to see who gets creative with this for their brands. 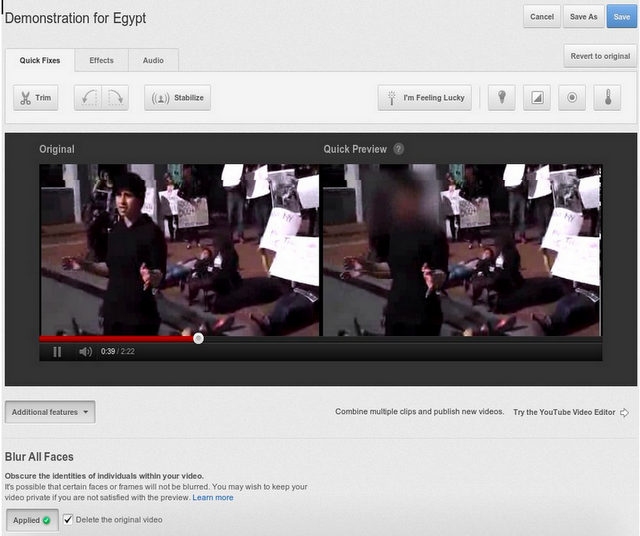 This entry was posted in Social Media and tagged activism, Arab Spring, face blurring, Google, NGOs, youtube by alexofarabia. Bookmark the permalink.